I wrote previously about how we were feeling about Potty Training and how we were finding it a month or so in. It has now been over 3 months since LP started potty training and she has done fantastically! Aside from very occasional accidents where she gets engrossed in what she’s doing we rarely have any toilet related issues and she can happily wait for the toilet during car journeys and when we’re out and about. Up until a couple of weeks ago we were still using our BabyBjorn Potty Chair downstairs when LP needed to go to the toilet. This was for a few reasons – Firstly, our toilet is upstairs and I was always worried that if I took LP upstairs she’d have an accident on the way. It was also easier, especially with another baby, to stick LP on the potty and empty it when convenient rather than having to take LP upstairs as soon as she requested it. But BabyBjorn gave us the opportunity to review their Safe Step and Toilet Trainer which coincided well with us wanting to start using the toilet upstairs – The Potty Chair had started to be a magnet for rolling Little Man and we were forever moving it out of his reach! What is the BabyBjorn Toilet Trainer like? The BabyBjorn Toilet Trainer is amazing! I never thought I would refer to a toilet accessory as amazing but it really is. 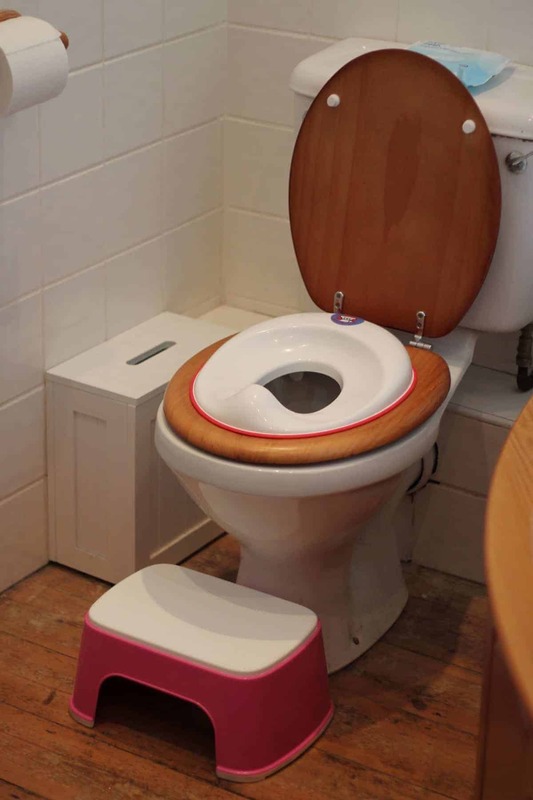 The Toilet Trainer fits perfectly inside the toilet seat and adjusts easily to fit any size toilet seat. There’s a streamlined handle which helps put the Toilet Trainer on the toilet and remove it as well as a way of hanging the Toilet Trainer up for storage. 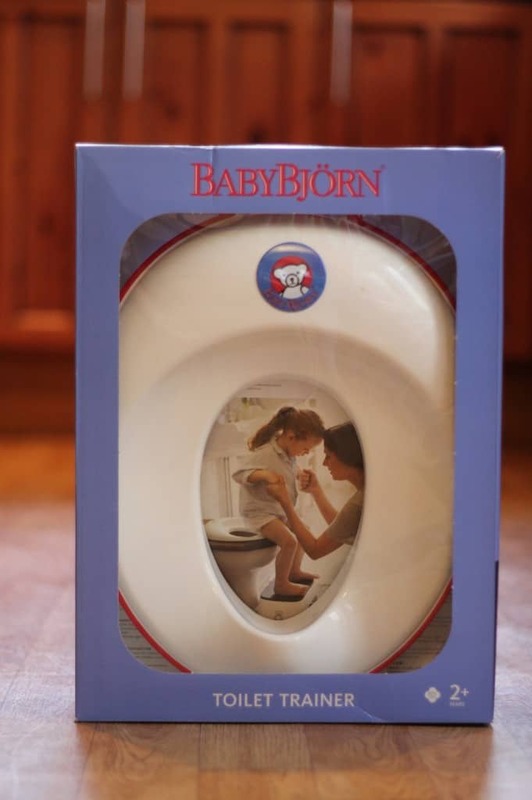 We found the Baby Bjorn Toilet Seat to be really well designed – It’s curved shape makes it more comfortable for the child to sit on and the raised splash guard at the front stops any mess outside of the toilet – We haven’t had any splashes or accidents since LP started using it. It’s also very easy to clean which is a definite bonus – No hard to reach places! What is the BabyBjorn Safe Step like? The BabyBjorn Safe Step is a really great size and fits in front of the toilet perfectly. LP has been using it to get on and off the toilet but also to stand on and brush her teeth at the sink. 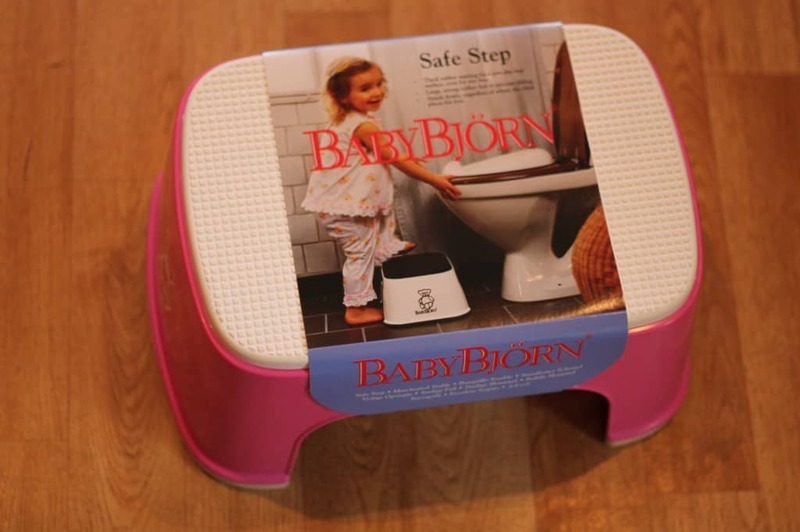 The Safe Step has a non slip top and also very non slip feet – The Baby Bjorn Step Stool doesn’t move at all when placed on the wooden floor of our bathroom. We’ve been using the Safe Step and Toilet Trainer for a couple of weeks now and from the start life was instantly easier! LP is petite for her age and I was worried about her not being able to use the Toilet Trainer as she was so small. LP needs help to sit on the Toilet Trainer but afterwards gets off of it easily. LP will still use a potty if needed but much prefers to use ‘Mummy’s Toilet’ – No idea where she thinks Daddy goes to the toilet! Using the BabyBjorn products, the Toilet Trainer especially has felt like natural progression for all of us. LP puts the Toilet Trainer on the toilet herself and sits comfortably for as long as she needs to. We love it as it makes everything easier for us – No more potty to empty and it’s so easy to clean! LP will be using the Toilet Trainer until she grows a lot little bit and I know that she’ll happily use the toilet each time – One less thing for us parents to worry about! The BabyBjorn Safe Step has an RRP of £17.99 and the BabyBjorn Toilet Trainer has an RRP of £29.99. Disclosure: We were sent the above products for the purpose of the review however all opinions are my own. Next Post The Great British Budget February Challenge!